Kenyan President Uhuru Kenyatta's meeting with his US counterpart Donald Trump at the White House carries symbolic as well as real value. The two leaders have met once before - on the sidelines of the 2017 G7 meeting in Italy. 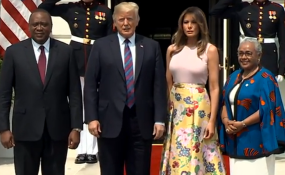 But this is the first official visit to the White House since Trump's election and since Kenyatta's highly controversial 2017 re-election. The White House has cast it as an opportunity to deepen the strategic relationship between the two countries, and to advance mutual interests in trade, security and regional leadership by way of reaffirming Kenya's position as a corner stone of peace and stability in Africa. For Kenyatta, it's an opportunity to reset Kenya's position as a leading regional actor and Africa's "ambassador". From a strategic perspective, Kenya has been a crucial player in the war on terror given its frontier status with Somalia. It has been a central player in the UN African Union Mission to Somalia force that's seeking defeat the Al-Shabaab terror group. So Kenyatta's visit will seek to consolidate continuing US military support. This will be through various channels, among them the counter terrorism partnership fund and the combating terrorism fellowship programme. He will also want a commitment to the US's continued military at Manda Bay and Camp Simba, a Kenya naval base for anti-terrorism operations. The US will seek to ensure that Kenya continues to play a constructive leadership role and a guarantor of the peace process in South Sudan given its tremendous leverage on that country's leadership. Other pressing issues will include trade and foreign direct investment. Here Kenyatta will have to tread carefully given Kenya's increasingly close ties with China. And Kenyatta will have his work cut out trying to navigate Trump's world. How he manages to gain meaningful compromise from an unpredictable and beleaguered host will be keenly watched both at home and far beyond. In many ways US-Kenya relations is in uncharted territory. And given Trump's penchant for bilateralism, Kenyatta will hope to master the art of the deal by minimising the negative impact of "America first" agenda on Kenya-US trade relations. During Barack Obama's presidency, imports from Kenya more than doubled . In 2015, 12.3% of US AFRICA FDI went to Kenya. But Trump's "America first" stance has led to a review of Africa partnerships as well as a renegotiation of bilateral trade agreements. Amid this policy uncertainty, Kenyatta will want to discuss how to boost trade relations to augment Kenya's domestic economy given the very broad economic agenda he has set himself to transform the country. Kenya's economy had suffered from electoral volatility and a slowdown in foreign direct investment, particularly from the US. Kenyatta will be keen to explore how to jump start this with his US counterpart in addition to ensuring the continued robustness of the African Growth and Opportunity Act (AGOA) from which Kenya has greatly benefited. Kenya's relationship with China has been growing in leaps and bounds. This is clear from the rise in foreign direct investment flows from China over the past 10 years. In addition, China has firmly developed a substantial economic and trade strategic relationship with Kenya - from manufacturing to infrastructure development. This hasn't gone unnoticed by the US. The wide gauge railway project, among many others, has established Beijing as an indispensable developmental partner. To reflect this importance, one of Kenyatta's first foreign trips was to Beijing. With the increasing trade war with China, the US will seek reassurance that its interests in the region will not be compromised by Beijing's increasing aggressive overtures in Kenya as well as in the region more broadly.